I thought this set of photos was fascinating. First few are of the admin office then the workshop. fantastic.. Imagine being able to take a shop tour during the day..
Look at all the guarding around the flying belts! Modern safety inspectors would have a heart attack. You can almost smell the grease, cutting oil, and cigarette smoke. Ballsy of those guys working that close to cast iron without much protection. Some big honkin' cores in those castings, too. Wonder if they were sodium silicate bonded or what method was used to bind them. great pictures of an era gone by. thanks for the picture link!!! It simply amazes me how they were able to engineer and build quality things back then. I can barely change a light bulb without consulting Google! Here is a workshop back in approximately 1930. Williams Gold in Fort Erie Ontario. They were also the makers of Williams Warblers fishing lures. 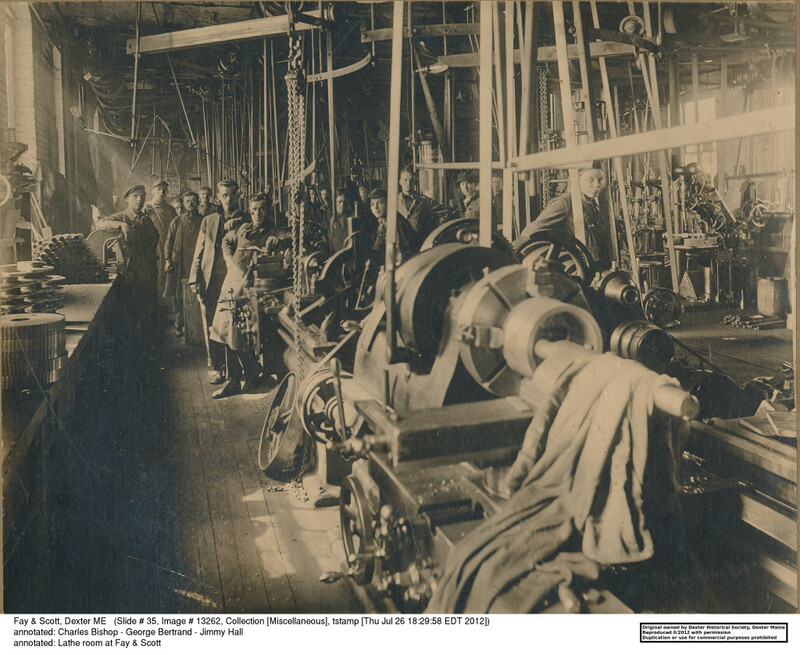 Note that the lineshafts are still in use but the belts have wooden covers at the machines. There is also some more pointed protection in place as well. I bet the guy supplying drive belts was a happy fellow! Great pictures thanks for posting. Guess OSHA wasn't even a dream back then. Amazing thinking of how things were made and with limited equipment back then. I don't know. It looks like they had a lot of tooling on those shelves on the left in that one photo. I bet those belts made quite a ruckus. The supplementary binders were numerous, We used a clay /water wash, starch powder , & sometimes some dried horse manure! For the tiny cores we used oil binders, Usually a linseed oil base, When making small cores this was pleasant stuff to work with. In those days there was a lot of skill involved, the old moulders were a happy go lucky bunch of guys, One just jogged along at a reasonable pace, Unlike today with its zero hours contracts, folks in charge who haven't a clue etc.. ! Well I guess I had then youth on my side + enthusiasm, & did not mind getting my face & hands grimy with the graphite powder, Would I do it all again or some other occupation? Thanks for taking me back into yester year (& some ). I liked the heavy machine leveling ramps , that's not something I've seen for over 49 years when they were used to level & true up a big capstan lathe capable of turning a six foot internal diameter at The Ruston Bucryus Works of Lincoln England . Absolutely amazing. I see some old Giddings and Lewis horizontal boring mills in a couple photos. I worked for them for almost 12 years. Some of those old machines are still running. I have worked on a couple. Some have been retrofitted with slightly newer technology. Wonder what the lever action rifle on the wall is for. Varmints, when they are far. Something for short range critters is on the left! it looks like chas g Allen drill presses in the back right. pretty cool to see where some like (what's left of) the one in my garage came from! just seeing a date and patent information is nothing like this. Great pics, thanks for posting them, Osha would have a field day if they were around back then. No they wouldn't. They would see so many violations, they wouldn't know where to start and their heads would POP! I will probably regret being such a killjoy, but a few of those pictures are obviously from a time newer than the title would indicate. Still, very cool and always a twinge of nostalgia comes through. Even disc sanders got a belt to the ceiling. Amazing. The cows probably were not too happy.